Eddie Izzard has written his first film. 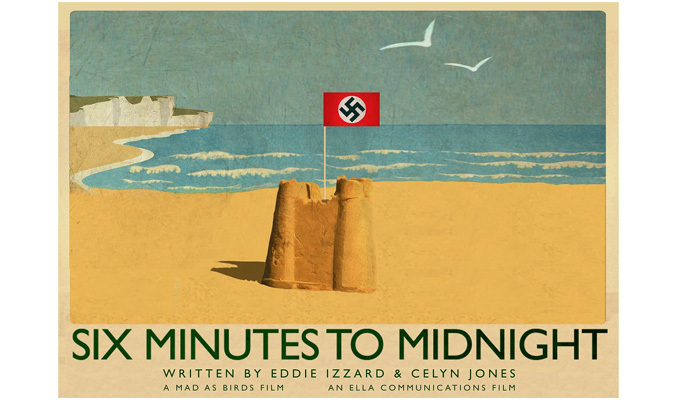 Six Minutes To Midnight is a Second World War drama about the daughters of Nazi high command who were sent to an English seaside town in the summer of 1939 so that they could learn the language and become future ambassadors for National Socialism. It has not yet been confirmed if Izzard, who has performed stand-up in German, French and Spanish, will play the central role of school teacher Thomas Fisher, who 'knows what is coming and tries to raise the alarm but no-one is listening'. Advance publicity for the film suggests that the seaside town is Bexhill-on-Sea, where Izzard spent much of his childhood. The town was a point of attack for Operation Sea Lion, the Nazi plan for invading Britain and has been cited as the likely inspiration for Walmington-on-Sea, the fictional town in Dad's Army. Izzard wrote the film's script with actor-turned-screenwriter Celyn Jones, with whom he appeared in the 2014 BBC Two wartime drama Castles In The Sky, about the development of radar. In an interview earlier this year, Izzard said the script chimed with today’s political climate, explaining: ‘It seems like we’ve just headed back to the 1930s, so suddenly this film has become something that can really resonate. Half of the world seems to be falling backwards, hating people left, right and centre, for absolutely no logical reason. The comic's former girlfriend, Sarah Townsend, is attached to direct Six Minutes To Midnight. It will be her first narrative feature after several documentaries with the comic, including the Emmy-nominated Believe: The Eddie Izzard Story. Adman turned film-maker Trevor Beattie is executive producer, and production company Mad As Birds Films previously made the dramatised 2014 Dylan Thomas biopic Set Fire To The Stars, which starred Jones as the poet, alongside Hollywood actor Elijah Wood and Kevin Eldon. Izzard has frequently referred to the Second World War in his stand-up and appeared in several war films, including last year's Whisky Galore remake and 2008's Valkyrie. 'I was brought up on these books about the war' he has said. 'I know war is hell, but I sort of wanted to be involved in that struggle. It was something to do with not taking in the reality of it all, but the derring-do. Derring-do? That sounds really crap - but the running jumping climbing standing still part of it, that was the reason I wanted to be in the army. There was widespread sympathy and even support for the Nazis among the British aristocracy and media in the 1930s, right up until Hitler's invasion of Czechoslovakia in 1939. Cultural exchange between the two nations was facilitated in large part by upper-class girls on both sides being sent to the other country to be educated in refinement and to hunt for husbands. 'Minutes to midnight' alludes to the symbolic Doomsday Clock, which measures the likelihood of man-made global catastrophe, and which is currently set at two and a half minutes to midnight.